This is a significant choice; his mixed origins symbolize the guiding theme of the festival. The Moroccan director's first endeavor into documentary filmmaking, it confronts head-on the Israeli-Palestine conflict. 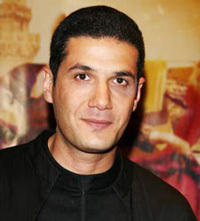 Nabil Ayouch interviewed Palestinian refugees and then in turn showed his footage to young Israelis. He had to face off with the Israeli Army and Palestinian militia in order to film My Land, which presents images of the daily life in Palestinian refugee camps in Southern Lebanon and kibbutzim located in Northern Israel. Born to a Muslim Moroccan father and Tunisian Jewish mother, he was the son of a Jew who suffered from the conflict festering in the two opposite families. "This conflict has become my conflict," says Nabil Ayouch.